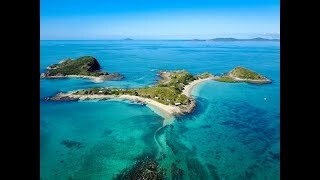 One of Australia's hidden gems and best-kept island secrets nestled in the Keppel Group of islands, 14 kilometres off the coast from Yeppoon. A holiday on Pumpkin Island offers a blissful escape from the stresses of modern day life and a chance to partake in pristine nature. Easily accessible by private boat or the Pumpkin Xpress, from the Keppel Bay Marina in Yeppoon. There you will find five eco-friendly self-catering cottages and two beach bungalows powered by wind and sun, overlooking a crystalline beach. Each accommodates between four and six guests. Guests can pre-order gourmet meals from the award winning Waterline Restaurant, at Keppel Bay Marina, collected on the day of departure. There is so much to do on this island treasure. The wildlife will delight you; expect to see dolphins, turtles and whales in season. Fish the rich waters, snorkel or experience the coral reefs from a glass bottom kayak, harvest your own oysters off the rocks or simply wander the secluded beaches. Perfect for safe swimming and snorkelling most of the year round. Pumpkin Island is wonderful for families, utterly romantic for couples and a hoot for a group of friends. Island View Bungalow lies on the north western beach side catering for the more laid-back, with shared bathroom facilities and a large outdoor kitchen. The central amenities building is only a short stroll away. Bedding Configuration: Two Double Bunk Beds with a capacity of four people. A three night minimum stay applies. Ocean Breeze Bungalow lies on the north western beach side catering for the more laid-back, with shared bathroom facilities and a large outdoor kitchen. The central amenities building is only a short stroll away. Bedding Configuration: Two Double Bunk Beds with a capacity of four people. A minimum stay of three nights applies. Pebble Point is located on the beautiful pebbled beach on the northern point of Pumpkin Island. It accommodates a maximum of four guests, with sleeping arrangements as follows: one queen bed and two single beds. Fully self-contained beach cottage, sleeping four guests maximum. There is a minimum stay of three nights. Tropical Tides is located close to the main beach and beach hut, overlooking the bay back to Yeppoon - the night lights and sunsets over Yeppoon are simply magical. It accommodates a maximum of five guests, with sleeping arrangements as follows: one double bed and four single beds. Fully self-contained beach cottage, sleeping six guests maximum. There is a minimum of three night stay. Coco Pine is located between beautiful Norfolk Pine and Coconut trees. An incredible place to be at whilst the wind gently whispers through the branches of the Norfolk Pines, creating a soothing sound along with the rippling waves on the water's edge. Sleeping arrangements as follows: one double bed and four single beds. Fully self-contained beach cottage, sleeping six guests maximum. There is a minimum stay of three nights. Five stylish cottages overlook the unspoiled beach. Each accommodates four to six guests, boasts a full kitchen, ceiling fans as well as barbecues on their respective private decks. Every cottage has a special name and décor as well as a beautiful view of the Pacific Ocean. They are self-contained and eco-friendly, powered by wind and sun, yet well appointed and charming. They have their own private bathrooms, with large decks offering front row seats to magnificent sunsets. Capacity is 34 people and a minimum stay of three nights applies. Oyster Box is situated in one of the most beautiful places on the Island and is in close proximity to the tasty oysters you'll find growing on the rocks. Well suited for the fishermen and their families who want to be close to the action. Sleeping arrangements are as follows: one double bed and four single beds. Fully self-contained beach cottage, sleeping six guests maximum. There is a minimum stay of three nights. Coral Cove is located close to the beautiful coral reefs and coral lagoon. The coral lagoon also allows for beautiful coral viewing during low tide for those wishing to only get their feet wet. It accommodates six guests, with sleeping arrangements as follows: two double beds and two single beds. Fully self-contained beach cottage, sleeping five guests maximum. Minimum stay of three nights.